This is a BRAND NEW OEM Honeywell Tradeline Humidifier Water Panel Pad. This is not a knock off like most online sites sale. The Honeywell Stock no. is HC22A 1007 and the water panel measures roughly 10" x 9" x 1 1/2. The Honeywell HC22A1007 water panel is made of layers of an aluminum mesh with a porous pumice-like coating. The coating allows the water panel to absorb water, but without it the water would bead up on the aluminum and the evaporation would not be as effective. Over time, the coating will start to crumble and fall off when in need of replacement. Our genuine Honeywell water panels are brand new and factory fresh. 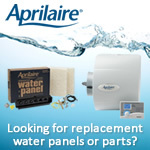 Due to the factory coating, all water panels may at first appear used, but they are all brand new. We sometimes hear from a customer that at first glance believes the panels are used.